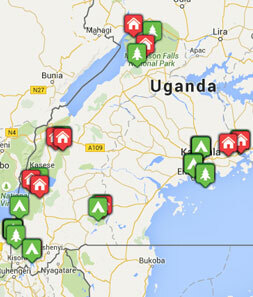 The Victoria Nile crosses Uganda going from Lake Victoria to Lake Kyoga and on to Lake Albert. Murchison Falls is a large spectacular waterfall on the Nile in the north west of the country. The water is forced through a gap of only 7 metres wide then drops 40m to continue its more gentle 30km journey towards Lake Albert. It is possible to see the falls from the top (south bank only) and also from a boat at the bottom - a trip which is well worth taking to see the hippos, crocodiles and prolific birdlife. For film buffs, you might like to know that Murchison Falls and Lake Albert were the backdrop to The African Queen with Humphrey Bogart. The falls give their name to the national park within which they are located. This is a huge park of about 3800km2 (Uganda's largest reserve) and was gazetted as a game reserve as long ago as 1926. 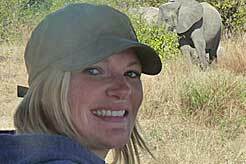 The park was Uganda's only ”˜big five' destination, but sadly rhinos were poached to extinction here. Ziwa Rhino Sanctuary about 3 hours drive south of Murchison is currently breeding and protecting rhinos once more, and hopefully they will one day be released into the park. However the park is still an excellent game viewing destination, with large herds of elephant and buffalo, many kob, an increasing number of lions, plus giraffe, hartebeest waterbuck and more. The Buligi circuit on the north bank of the Nile is usually deemed to take you to the best game viewing areas, but the whole park offers a great experience. The birding is excellent here too, and it is one of the few places left where you can see the rare shoebill stork. 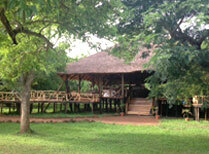 A small tented lodge just downstream from Murchison Falls offering boat trips, game drives and chimp trekking. 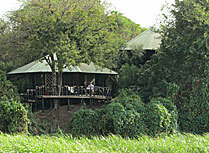 A safari lodge on the River Nile in Murchison Falls National Park.